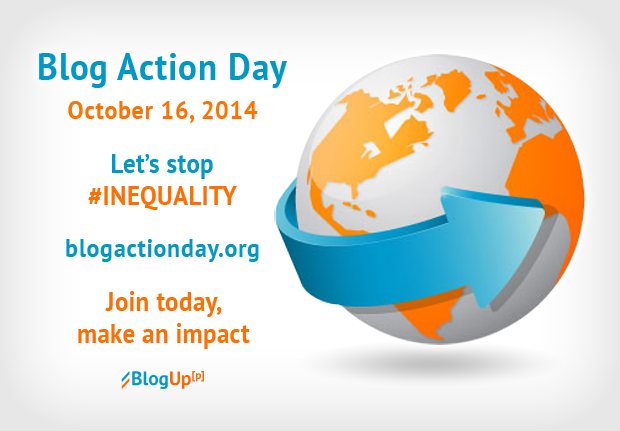 This year's Blog Action Day (Oct 16) is dedicated to #INEQUALITY. Bloggers are invited to involve and help make an impact. By uniting many voices around inequality we'll create a powerful global discussion and achieve more. Non-bloggers are also welcome to raise awareness through their social networks, as well as take appropriate action in offline interaction whenever facing inequality situations. We have gone a long way to have issues like slavery, racism and gender discrimination almost disappear in most countries. Still, there is much to be done to fight inequality. Many of us living in well developed societies take for granted our privileges, which are not accessible to lots of people. Unequal access to education, quality health systems, justice and alike - is still an issue. For actions to be taken in this context, a good start is to raise awareness. That's what Blog Action Day aims to do, every year, on a single day - 16th of October - unite bloggers, non-bloggers and partners to create an amplified global discussion around one single topic, representing a social issue. Submit your blog today and learn more on how you could involve to fight inequality. You could also get a few ideas for your #inequality blog post from the interview we had with Karina of Blog Action Day. Obviously, certain things can't be changed, such as the country of birth with its social environment, which at times plays a big role in the social facilities and opportunities we get initially. Nevertheless, there are inequality issues which we could change, and should. Please share and invite your fellow bloggers to submit their blogs and participate too. The more we are, the stronger the impact. Thank you in advance for your contribution to make the world a better place.